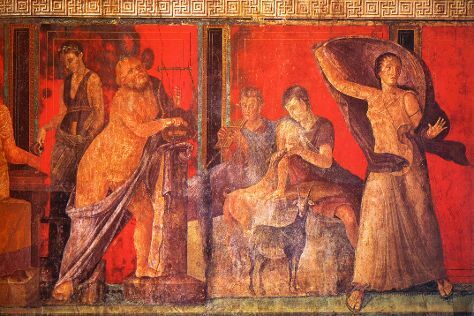 Pompeii has been a tourist destination for more than 250 years. Today, it is a World Heritage Site and one of the most popular tourist attractions in Italy, with approximately 2.5 million visitors every year. Once a thriving Roman city, Pompeii was destroyed by a cataclysmic eruption of Mount Vesuvius in 79 CE. Ash and soot engulfed the entire settlement, killing nearly 3,000 people and preserving the city in its original state. This is one of the most-visited archeological sites in the world. Together with the neighboring Herculaneum, which suffered the same fate, Pompeii presents an amazing opportunity to see how people lived nearly 2,000 years ago. Pompeii is in Province of Naples. Take a peek at our international travel planner: Pompeii and its charms laid bare and easily scheduled. For easy foot access to Pompeii's archeological sites, consider checking into a hotel or B&B near the world-famous excavations. You can walk around the ruins by day and enjoy panoramic views of the area from your balcony by night. Centrally located Pompeii hotels are conveniently situated near the area's main road and railway networks, making them an ideal base for exploring the surrounding region and the Amalfi Coast. You can also choose to book your rooms in nearby Sorrento or Naples, which offer a wider range of less expensive hostels and self-catering apartments.